Business as usual for Spiritual Beggars, then; another album of good songs, strong playing and wrapped up in an impressive production. If you long for the days when Blackmore still played rock and jeans were flared, this album is certainly for you. It should be noted that there are two things about this record which really stand out: the sound and the performance. The sound is fantastic, live and raw but crystal clear... the performance? Even more remarkable, as this was tracked live, yes live, off the studio floor! Follwing the Deep Purple obsession exhibited on “Earth Blues”, I was interested to see where Spiritual Beggars would go with “Sunrise to Sundown”. There are no huge detours here. This is 70's style hard rock- think Rainbow, Deep Purple, Led Zep etc and you are there. There are heavier moments too, in some of the tracks there are echoes of the members alma maters (and an impressive list that is too; Carcass, Arch Enemy, Grand Magus, Opeth, Firewind etc!). Apollo Papathanasio returns here with a full throated performance, while Per's keyboards (notably the Hammond Organ) are a feature that is pushed to the fore. It should be noted that there are two things about this record which really stand out: the sound and the performance. The sound is fantastic, live and raw but crystal clear... the performance? Even more remarkable, as this was tracked live, yes live, off the studio floor! Old school to the last, the band are a credit to the genre and have recorded an album of fine performances here. “Diamond Under Pressure” is a catchy radio hit... or would have been if this was still 1976, while the aforementioned echoes of heavier sounds surface on “What Doesn't Kill You” and “Hard Road”. It always seemed odd to me that Spiritual Beggars were bracketed with the stoner/doom bands from the mid 90's onwards. I always felt them to be revivalists, pure and simple, but I guess that there is enough cross over with Sabbath (notably Dio era) for that pigeon holing to have occurred. The eleven tracks here are uniformly of high quality , some more hooky than others, some heavier, most fairly concisely written- even “No Man's Land” comes in under six minutes with a rather “Heaven and Hell” type feel to it. Ludwig's performance (no doubt on Ludwig drums!) is excellent as usual- he plays hard and heavy with a good sense of groove- no overplaying. The Likes of” Dark Light Child” show the band in full flow with killer riffs in tow. Perhaps it could be argues that “Lonely Freedom” almost veers into Fu Manchu like territory with its fuzzed ups sounds and rolling open groove, but the band does not stray too far from that which begat them- the second word of the lyrics is “rainbow” after all! The album closes strongly with the one two combination of “You've Been Fooled” (pure Purple, Coverdale era) and the more brooding “Southern Star”. 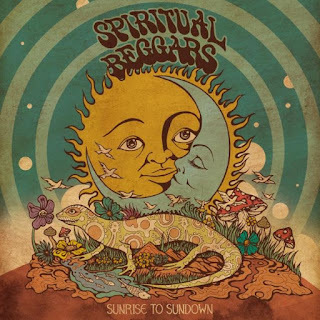 Business as usual for Spiritual Beggars, then; another album of good songs, strong playing and wrapped up in an impressive production. If you long for the days when Blackmore still played rock and jeans were flared, this album is certainly for you.